With the Myanmar capital’s challenging market landscape, Colliers recommends creating hotels with memorable experiences. Yangon’s busiest district has had limited presence of upper-scale hotels, the latest being Traders (rebranded as Sule Shangri-La) in 1996. However, Downtown is now geared towards a resurgence of luxury hotels, with the majority being located in the clustered vicinities of Pabedan and Kyauktada townships. Yangon’s rich collection of historic buildings should help shape the city as a distinctive and attractive tourist destination. But Yangon’s upper-scale hotel room stock was unchanged for the last four consecutive quarters. Since completion of the Melia Hotel in Q2 2016, the supply remained at 3,875 rooms. 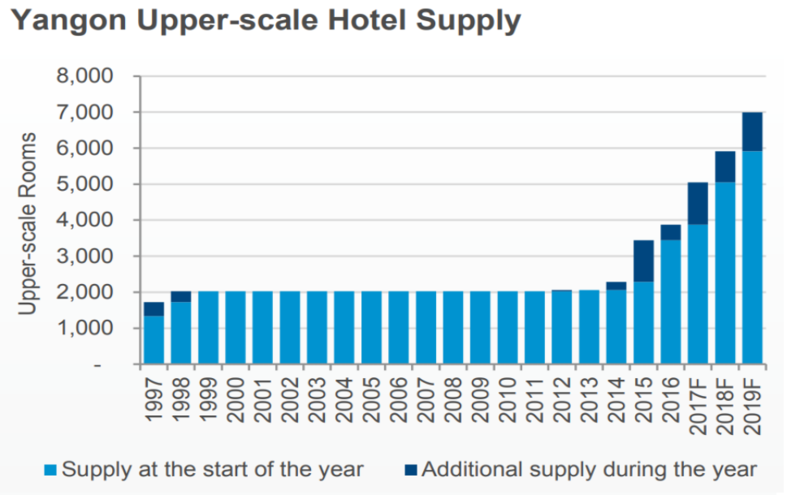 New hotels this year should reach a record high. 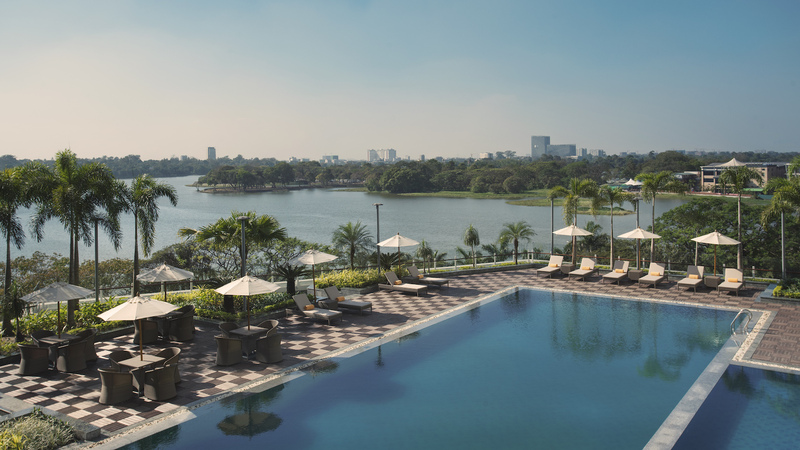 Plus two new hotels along Bogyoke Road, one being the conversion of a colonial building (former Myanmar Railway Headquarter) to Peninsula Yangon. Colliers believes prospects look promising for Yangon, particularly with Downtown’s potential of becoming on par and even exceeding other famous heritage sites such as in Singapore, Malaysia, and Vietnam, as evidenced from the performance of The Strand Hotel and Belmond’s Governor Residence. Affluent leisure travellers are willing to pay a premium for unique guest experiences. To achieve such, Colliers recommends future developments to emphasise and highlight the historic and cultural characteristics of the building, and to address modern comforts. The sizable rise in new stock is taking a toll on Yangon’s upper-scale hotel market, driving many hotels to lower down ADRs. As of Q2 2017, the citywide rate ended at USD111, down by almost 7% YoY. 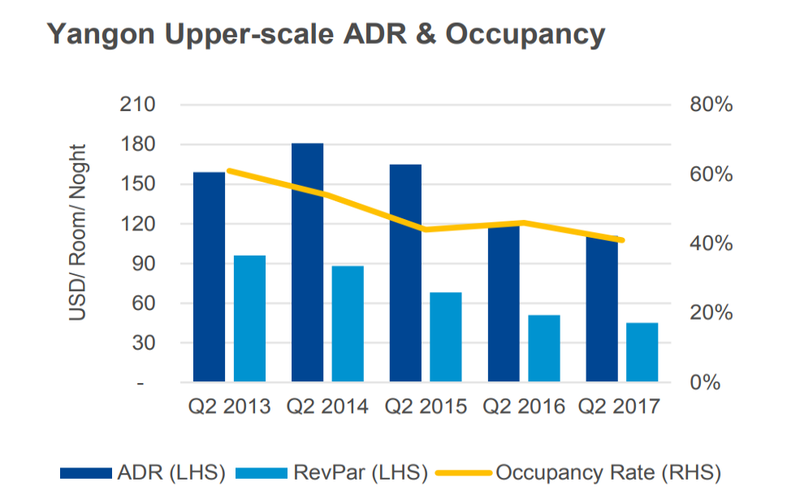 And average occupancy further dwindled by 1% YoY. The sheer volume of future supply, most being upscale in nature, means that differentiation would be necessary going forward. Colliers suggests investors should develop new concepts, such as adopting modern communication technologies, integrating tailored local activities, offering distinctive memorable guest activities as well as introducing unique and experiential amenities – overall creating a destination itself. For more information, email Karlo Pobre from Colliers International via the link below. Have the affordability issues been addressed in the Yangon condominium market?